Butera Royal Vintage | Chicago's Pipe, Cigar & Tobacco Store | Iwan Ries & Co. 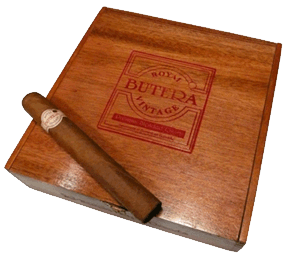 Introduced in 1993, Butera Royal Vintage are handmade in the Dominican Republic by first-row cigar makers. The blend consists of six distinctive whole-leaf tobaccos from three different countries: Dominican fillers, Indonesian binder and the silkiest of Connecticut Shade wrappers. A delicate aroma greets the senses, while a smooth, buttery and creamy smoke envelopes the palate. A delightful mild smoke.